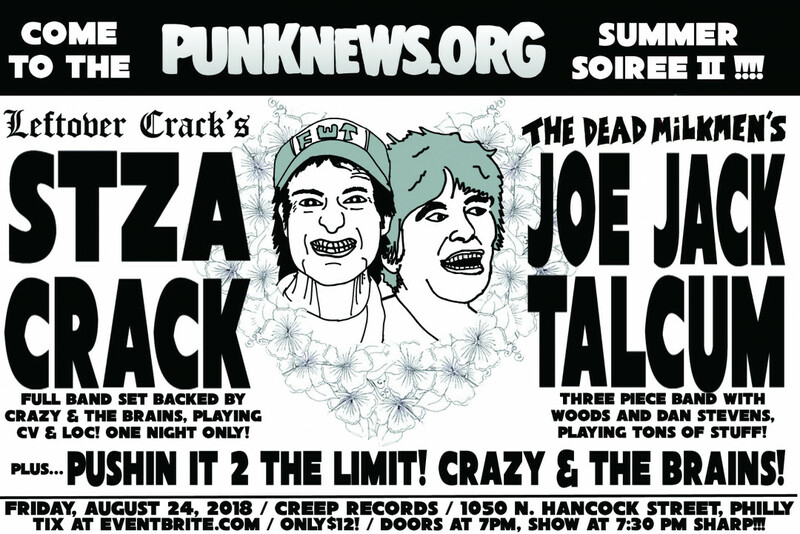 Stza Crack and Joe Jack Talcum to co-headline Punknews Summer Soiree II in Philly on Aug 24! Let's do it again!!! Following last year's hootenanny with World/Inferno, we're throwing another kickin' show this summer and boy do we have party planned, baby! It's August 24 and in Philly! This year we've got two, count 'em TWO, headliners! None other than Stza Crack of Choking Vicitm and Leftover Crack with be playing a FULL BAND SET backed by Crazy and the Brains! This is a one night only, one time special performance! They'll be playing songs by CV and LoC, and maybe a few other surprises! Yowza! But on top of that, punk rock hero Joe Jack Talcum of The Dead Milkmen will be playing a band set, backed by Woods and Dan Stevens! They'll be playing Joe Jack solo stuff and perhaps some Milkmen hits! Joe Jack captivates the room like no other. Ooooh yeah!!! And then, on top of that, Crazy and the Brains will be playing a set of their own, including some of their brand new tunes. On top of THAT, Philly power-punk trio Pushin' It 2 the Limit are going to open the show and will be playing some hot new jams from their brand new recording! DUDE! But that's not all! We'll also have an exclusive tape that you can only get at the show! (More details on that later…) We'll also have goodie bags for everyone that comes to the show. We'll ALSO have a charity raffle benefiting Children's Cancer Research Hospital! Wowza! The show is August 24 at Creep Records in Philly. It's only $12! Doors are at 7pm sharp and music is at 7:30pm SHARP. DO NOT BE LATE. THIS SHOW IS NOT ON "PUNK TIME." You won't want to miss a moment. Please note that Creep records is a relatively small venue, so if you want to go, you'll want to get advance tickets because this may very well sell out. The event is all ages. See you there!